Ahhh, the holiday season — the time of the year to spread good will and cheer to your fellow man. That is unless you are two of the best golfers in the world. 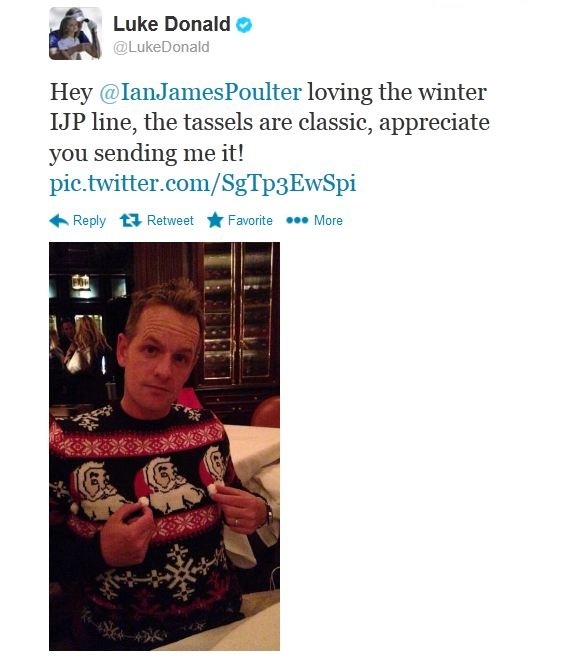 Luke Donald and Ian Poulter took to Twitter yesterday for some friendly sartorial sparring. Surprisingly, Donald threw the first jab with the following tweet about an ugly Christmas sweater and Poulter’s apparel brand, IJP Design. I can only guess that Donald felt the need to instigate this fashion fracas after learning that Poults was ranked one spot higher on GolfThreads’ list of the Best Dressed Golfers of 2013. Poulter then countered the 5’9″ Donald with the following left hook. Unfortunately, this style scrum ended as quickly as it started. If only Adam Scott jumped in with a tweet to Graeme McDowell about an ugly Christmas cardigan or Billy Horschel tweeted Graham DeLaet about ugly Christmas plaid pants, we could have had a full-fledged golf fashion battle royale.